Kanarra Creek Falls by the author, Jim Harmer. 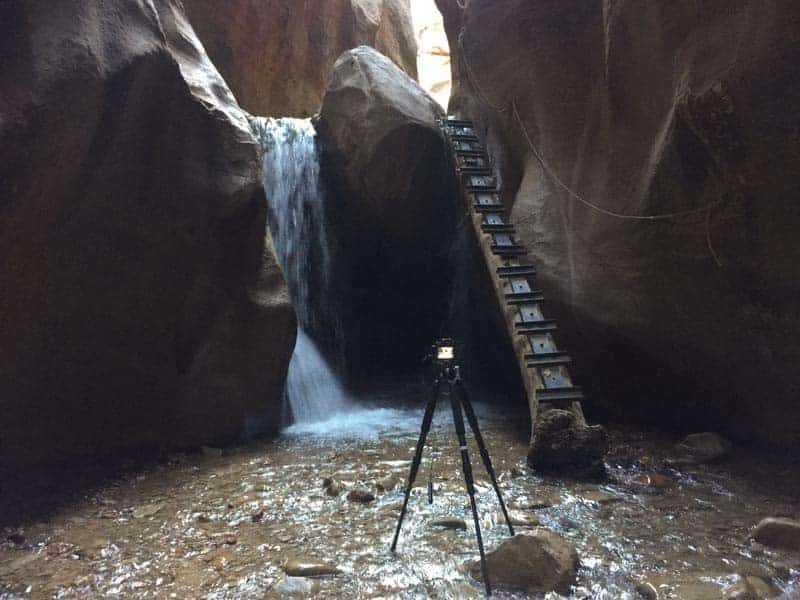 If you'll be hiking to Kanaraville Falls, then you definitely need to check out my Photographer's Guide to Zion National Park, with tons of other photo locations in the area. IMPORTANT TIP! Since publishing this article, we created the ULTIMATE tool for planning a photography trip to southern Utah. It's called Really Good Photo Spots, and Kanarra Creek Falls is listed in the app with more info. It's a free iPhone and iPad app with THOUSANDS of the best photo locations in the world all in one app. Nearly every country in the world has many spots, and southern Utah is absolutely COVERED in spots on the app. It's really convenient for travel photography because you can just tap “Spots near me” and BOOM! It lists all the best spots to take pictures near you. Download really Good Photo Spots for the iPhone or iPad right here. I spent the first day on a solo hike to Kanarra Creek Falls near the town of Kanaraville in Southern Utah. 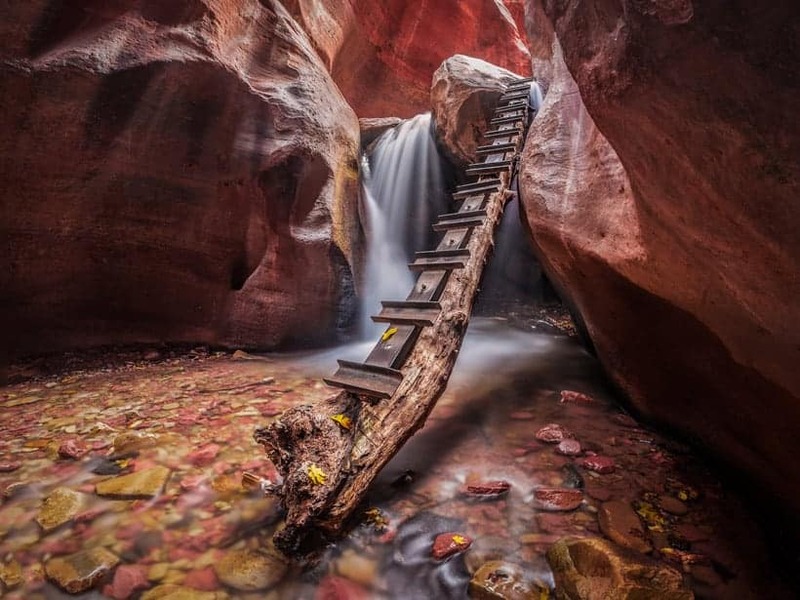 This is a small waterfall (about 8′ high or 2.4 meters) with a beautiful wooden ladder for hikers to climb over the falls. Kanarra Creek Falls is right outside the little town of Kanarraville. You could hit a golf ball from the trailhead to the town square. Basically, you'll just roll into town and take 100 North street to the mountain. Set your GPS to 250 North Street in Kanaraville, Utah and then just follow it to the mountain. At the end of the short street there is a small dirt parking lot that costs $10 to park. Here is a link to a Google Map showing the exact spot. You park where the white road stops. It's really not difficult to find. The hike into the falls is a short 1.75 mile jaunt and takes about 45 minutes. The first half mile is moderately elevated and you may have to stop once to catch your breath, but it's passable even for younger kids. Then the hike levels out and you'll pass near the stream several times. You cross the stream occasionally, but the vast majority of the hike is on a trail next to the stream. You can't get lost. There is really only one route and it's well traveled. At the end of the path you see the slot canyon. The waterfall is just 100 yards into the slot canyon. After the first waterfall (the one in the photo above), you can continue on to another less photogenic waterfall, but most people just photograph the lower falls. The upper falls is not too far, though. The deepest spot in the entire creek (in November) was barely to my calf. It's very shallow this time of year, and judging from the water line, it doesn't look like it gets much higher. I shot the falls in the morning, arriving just shortly after sunrise. I wish I had gone later in the day. After seeing the angle of the canyon, late afternoon (an hour and a half before sunset) would really be the optimal time to photograph this place. That would put the light coming in from behind the waterfall and illuminating the walls of the canyon much better. I got about 4 minutes of the walls of the canyon glowing while shooting in the morning, but it was a minor amount of light and very short-lived. Don't plan to shoot this location right at sunrise or at sunset. It would be too dark to expose and the light will be too low on the horizon to get into the slot canyon. Whenever there are cliffs or mountains involved, you have to throw out the traditional wisdom of what time there will be good light. iPhone shot of the location. You can see that the phone struggles to expose the entire dynamic range, and it also shows you just how dark it is in the canyon. No need for headlamps as you're walking through, but the camera will struggle. Dynamic range is the biggest trouble with photographing this location. The walls of the slot canyon are approximately 80 feet (24 meters) high, so you capture rock that is up high next to the sun, as well as rock that is in an 80 foot cave. Some areas of the photo are far too bright, and others far too dark. I used several tricks to capture a wider dynamic range. First, I used the old “hat trick.” I always wear a black or dark gray hat while out shooting so that I can hold it in front of the top of the lens for part of the exposure to darken down that area. This works extremely well when shooting long exposure. I also shot some vertical panoramas and slightly decreased the shutter speed on each photo as it got higher. This made the exposure shorter on the top of the panorama than the bottom. The last thing I did to help the dynamic range was to use a polarizer. No, not a graduated neutral density (my hat does the same thing). A polarizer. The polarizer was excellent at cutting out the reflections on the bright areas of the red rock so they wouldn't wash out. Some people may choose to shoot bracketed and tonemap later, but I don't really use HDR much anymore. The hike in to the falls is beautiful, especially in the fall (I'm here the first week of November). But there isn't any strong foreground element for most of the areas, so it'd be tough to pull off a shot that didn't feel too cluttered. 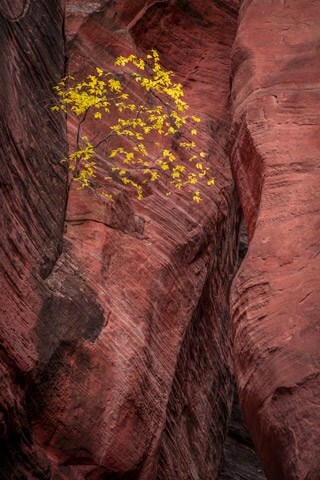 As I entered the canyon, however, I spotted a little autumn tree growing out of one of the cracks in the red rock right at the base of the slot canyon, so I stopped to photograph it at 70mm on an APS-C sensor camera (read why I ditched my full frame Nikon). 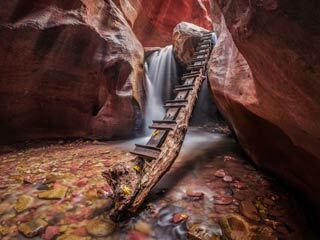 I also found another composition looking back from the waterfall toward the opening of the slot canyon. I found some drift wood to include in the foreground and got kind of a fun shot. Nothing earth-shattering though. It's tough for other compositions to compete when you have such a gorgeous spot like the falls. In the heat of the summer, walking through the creek will probably be a refreshing change from the extremely hot temperatures in this area. But the water in the creek can be bitter cold for much of the year. For just walking, you'll do fine with some water shoes for most of the year. But if it's chilly out, you'll want to consider wearing waders. I would not have been able to shoot it without waders in the first week of November. When you're at the waterfall, the best perspective is having the camera about 3′ off the ground, so waders will allow you to kneel down in the shallow water and shoot comfortably for an hour. I made a few Lightroom Presets for use with red rock. It makes a HUGE difference! It has taken me several trips to this area of southern Utah to learn how to get the red rock to look just right in photos. It's absolutely gorgeous in-person, but for some reason camera sensor's just can't quite capture the color correctly. A few things that help are to adjust the white balance to be slightly warm and push the tint to the purple, then add saturation instead of vibrance. In the HSL panel, I like increasing the luminance of the orange channel and pushing the hue of orange and yellow over to the magenta side. But the real magic happens in the split toning panel. You really need to add some red to the highlights and deep purple to the shadows. That's where I see the biggest difference. But you can save yourself all the trouble of this if you get my one-click Lightroom presets package for Zion National Park. It's just $15 for 16 presets made specifically for working with the red rock in this area. 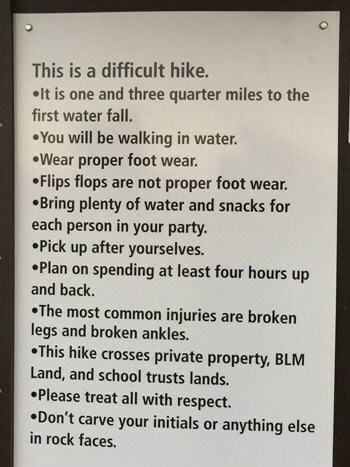 This sign is in the parking lot as you head up the trailhead. Never, ever, ever enter a slot canyon when it's raining. All of the water hitting the hard rocky soil will immediately funnel into the slot canyon and in SECONDS you can be in the middle of a raging river. While this particular slot canyon is much safer than some others because it is so short that escape is easier, it's never a good idea to tempt mother nature. Use caution and look at the forecast before you go. If you do get caught in a flood, seek a high spot at least 6′ off the ground and wait for waters to subside, which can take up to 24 hours. Rescue cannot come in a slot canyon, so be patient and stay safe.